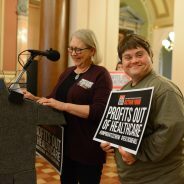 Home Posts Tagged "Iowa Statehouse"
You’re being heard on Medicaid – take action! 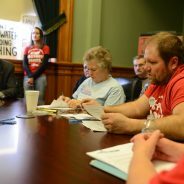 Tuesday at the Statehouse, your call to end Iowa's failed privatized Medicaid mess was heard loud and clear. In sit-down meetings, you shared your stories directly with lawmakers, the Governor's top policy staff, and the DHS Deputy Director. It was impactful. How do we know? 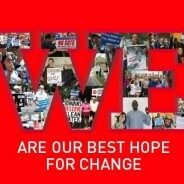 Lawmakers on both sides of the aisle have said that something needs to be done ... because they're hearing from you! The Iowa House voted 59-41 to pass Senate File 512, a bill to fund unspecified, voluntary water quality measures with taxpayer money. CCI Action members say this proposal robs Peter to pay Paul. Read why this bill is bad news and the one thing we're celebrating. 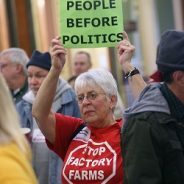 On January 16, over 100 Iowans showed up at the capitol to lobby for a moratorium on factory farms until there are fewer than 100 polluted waterbodies. CCI Action members joined the Iowa Alliance for Responsible Agriculture for a press conference where Senator Johnson and Representative Steckman announced their support for a moratorium and introduced a moratorium bill in each chamber. Following the press conference, CCI Action members prepared for a series of meetings with key legislative leaders that have important roles to advance the moratorium bill.